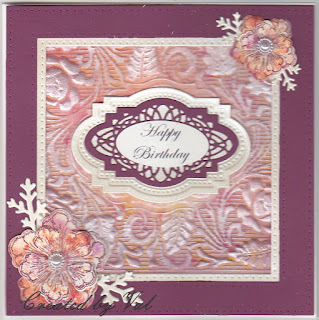 I love the 3D embossing folders and there are numerous ways to use them for different effects. Today I've made a background by sprinkling Pixie Powders onto watercolour paper before embossing. I'd made a piece large enough to stamp and die cut some flowers too and there is still a reasonably sized piece left for another project (and a few spare flowers). The embossed panel was cut down to fit a square card and some frames were cut to fit using card the same colour as the stamped detail on the flowers; I also used some pearly gilding polish to enhance the embossed design. The sentiment has been popped onto a layered die cut and flowers and leaves added just in the corners because I really didn't want to cover up too much of the beautiful embossing. One of the advantages, or drawbacks depending how you look at it, is that when cutting frames you are left with lots of 'waste' from the centres so I think I must apply my mind to deciding what I can do with a pile of miscellaneous squares. Frame and flower detail - rich razzleberry card and ink from Stampin' Up. Beautiful work, love the Pixie powder colours. These folders were released while I was away Val, I thought I had got away with out buying them but seeing your gorgeous cards you've made with them I will have to rethink. WOW - this looks amazing Val. Fantastic card. This is gorgeous. Am impressed with the look of the 3D embossed folder. I think I need to investigate further! 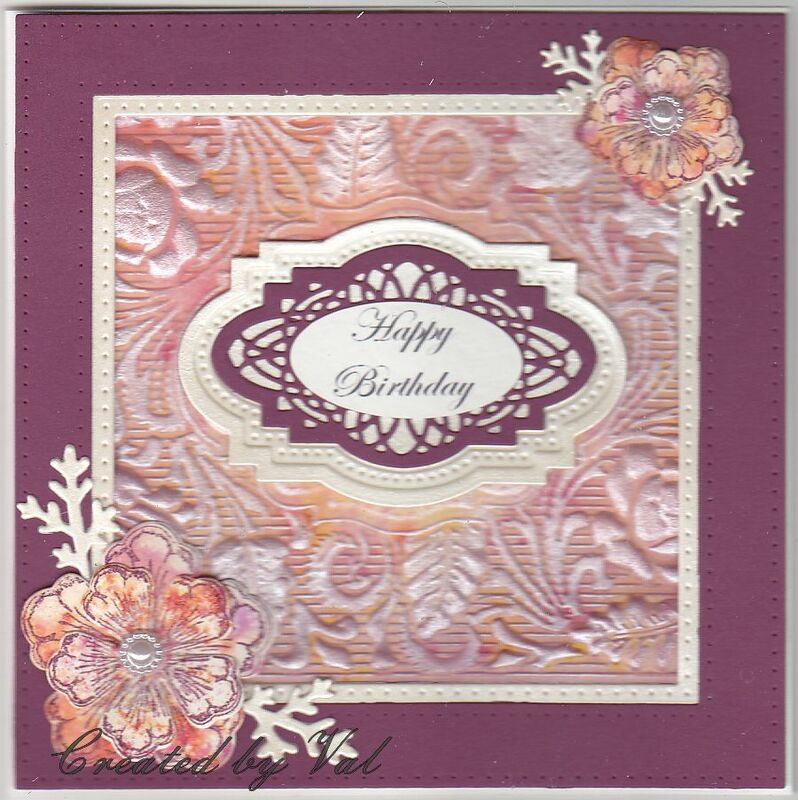 Hugs Mrs A.
so very pretty and elegant...embossing does add such interest and your card is a great example of the beauty. Wow Val, what a gorgeous card. Love the pixie powder colours and stunning embossing!